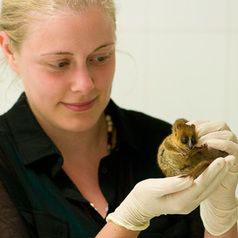 My research interests focus on the conservation biology and ecology of birds and mammals, specifically in how people's decisions affect the ecology of wild species. I am particulary interested in how human activity affects ecological interactions at a range of scales, especially in trying to uncover some of the unexpected and unpredicted consequences of our behaviour. I am interested in whether our efforts to come close to wildlife and nature has an indirect effect on non-target species. In the UK almost half of homeowners provide supplementary food for birds, providing us with an opportunity to study the consequences for other species. At the same time we provide plants, ponds and other habitats to encourage wildlife, while providing homes to predators and barriers to species movements. How do these changes to urban ecosystems influence the structure of food webs in our towns and cities? Recently projects have looked at domestic cats as urban predators and the unexpected effects of supplementary feeding (for both small passerines and red kites).